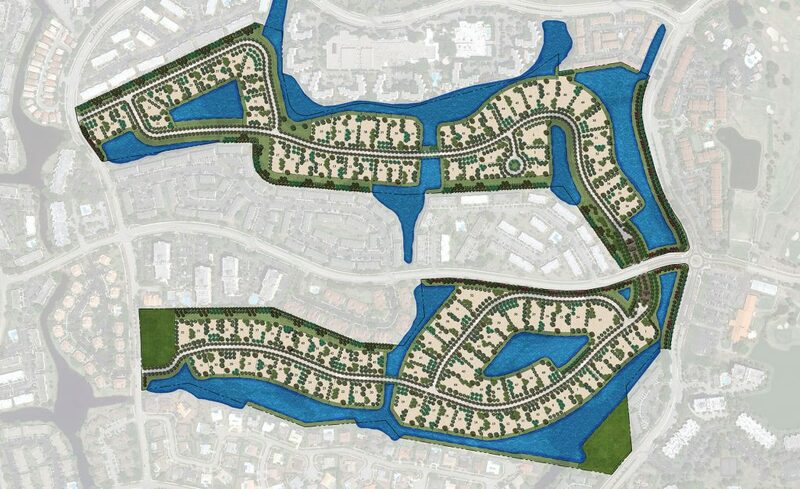 Redeveloping a 121-acre golf course into a residential community with 125 luxurious estate lots. Historically part of the Bonaventure Country Club, the development preserved the most viable 18-hole golf course, while repurposing the remaining 18-hole course as a low density single family community. The master plan includes reconfiguration of the lakes while maintaining on-site storm water storage and connectivity to existing off-site lake system. The design incorporated entry features, roads, lakes, lot layout, streetscape, perimeter buffers and parks. Landscape Design Workshop provided project coordination throughout the lengthy entitlement process that also included re-platting, site engineering, cleanup and remediation. This monumental team effort concluded in early 2014 when the project site plan was unanimously approved. In 2015 Landscape Design Workshop joined the all-star team assembled by Terra Group, the project developer. The design team includes Chad Oppenheim of Oppenheim Architecture+Design; Roney Mateu of Mateu Architecture; and Venus Williams, the international tennis champion, founder of V Starr Interiors. Landscape Design Workshop provides the planting, irrigation, hardscape and lighting design for the entire project, including all common areas as well as the individual lots.